Imagine the perfect afternoon. The Cotswolds. Clear blue skies. Open top-sportscar. A beautiful girl in the passenger seat. And 300bhp under your right foot. 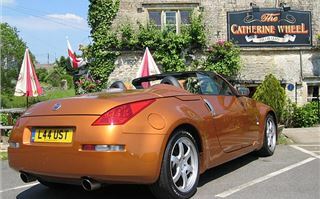 Could it have been the combination that made me like the Nissan 350Z Roadster so much? Or was it the car? It was even my favourite Nissan colour, described as “Sunset Orange”. 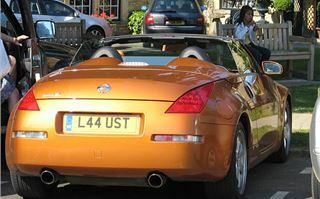 It had Nissan’s excellent Birdview DVD satnav, a reasonable £1,200 extra. And ‘Alezan’ Orange leather seats, that won’t be to everyone’s taste but had a kind of sweatwork effect woven section that stops you sticking to them. Dropping the top is a fiddly old process. You have to unclip it at the centre of the screen rail, have the engine running, put your foot on the footbrake, then find a button hidden under the dash. But when it’s down the car looks fantastic. Unlike many sportscars, the cabin is actually very spacious with plenty of useful places to stow or put things. You don’t feel claustrophobic in as you can in an MX5. And when you adjust the steering wheel height the instruments go up and down with it, so you can always see them clearly. The engine note is pure fruity, bellowing V6 sportscar. Not too loud. Just wonderfully sonorous. The gearshift is precise, yet pleasingly clanky and old fashioned. You feel like you are working a big, strong box, plenty man enough for the engine’s substantial 353Nm torque. And you have to get clutch and revs right, which is as it should be. It’s a powerful car. You have to think. You can’t just get in and drive. On paper, the performance is supposed to be near identical to the Mercedes SLK 280 I had last week. 0-60 in 5.9 seconds. Top speed limited to 155. 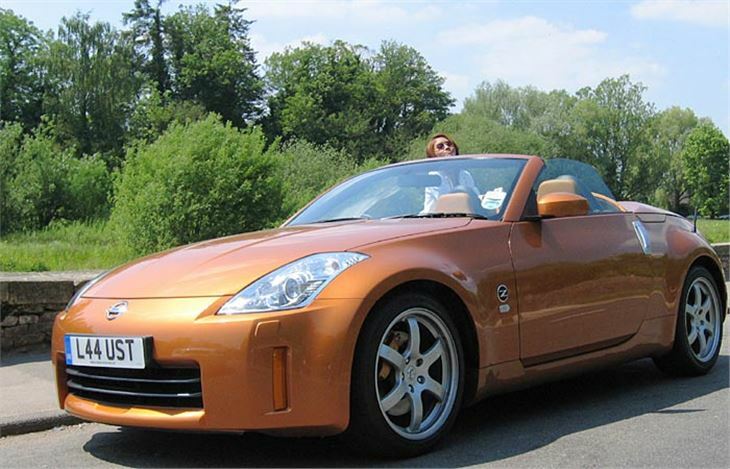 But, being manual, the Nissan feels massively faster. Traction control switched off for the steep hill out of Broadway it simply stormed up in a succession of neatly contained drifts, leaving everything else in its wake. Strangely enough, on our run through the Cotswolds, we kept seeing Austin Healeys. And I’d like to take this opportunity to thank Cotswold residents for continuing to be the most polite and generous motorists I have shared roads with in the UK. On the way back to Surrey we got stuck in a traffic jam. Took more than an hour to cover a mile. Yet despite the fun in the Cotswolds and idling fuel away in the jam we still managed 23mpg, which is only 0.5mpg short of the official combined figure. The pleasure continued with a sightseeing run into London on a sunny Sunday. Docile as an old dog in the inevitable nose-to-tailers. A surprisingly comfortable ride on the pockmarked, traffic harming streets of Mouth Ken despite 225/45 R18 fronts and 245/45 R18 rears. Much better than the SLK280 on 225/45 R17 fronts and 245/40 R17 rears. I love this car. It’s powerful enough without being silly powerful. It handles brilliantly with bags of feel. It isn’t crazy money to buy. It’s brutally ugly, like a squashed toad. But I like that too. Sure the boot is tiny, the roof mechanism isn’t the best and you can’t see much with the top up. I don’t care. I much preferred it to the SLK280 and if I had the cash to spare I’d definitely buy one.